Two weeks ago I was in PetSmart. I can't seem to just run in and run out. I have to look at the poor little animals up for adoption. One really stood out. It was a cute little grey tabby with only one eye. I am always drawn to the animals that are in the most need. I rescued my dog from a life of living in a camper trailer. All of my cats were rescued too, some from some pretty terrible situations. So when I saw the one eyed cat I felt awful for her, and thought about her all week. Saturday I went back to PetSmart (its an hour drive from my house) to adopt the cat. First I called PetSmart. They transferred me to adoptions. Turns out they have two different agencies doing adoptions and I got the Humane Society but the kitty was with Paws, who was not answering their phone. The Humane society wouldn/couldn't tell me anything about another agencies pets. So I had to make the drive. I went directly to her cage and almost cried when I saw a big Adoption Pending sign on her cage. I am so glad she is going to a home that doesn't mind that she is missing an eye and will love her anyway. 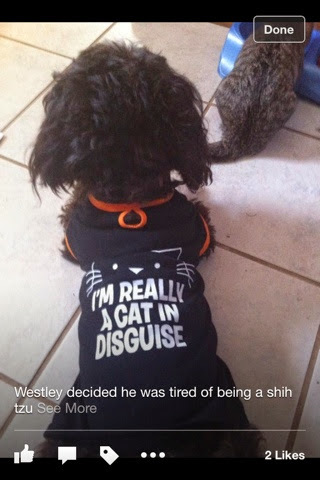 Westley decided he is tired of being the only dog in a house full of cats so he is incognito now. I too have rescued all of my pets - my 4 dogs and my 1 cat, so I know that feel. "I mean, what's just ONE more...?" Aw. I'm glad the cat is getting adopted. We rescued our cat too. Aww I'm sorry the cat was adopted! me too, I'm just glad it has a good home. I had picked out cool pirate names for her, and looked for kitty eye patches. I'm sorry you didn't get the kitty, but at least you know it's going to be loved by someone still. True, and really I didn't need another cat. I just didn't want it to be sad in a cage for how ever long it had left to live. Love your dog's outfit! I don't own any cats. Just one dog. I have huge respect for people that rescue animals. Thanks. I just have a hard time saying no to cute little faces.